The not-for-profit sector is supportive of whistleblower protections, but not if a new set of obligations are imposed on the sector without due consultation and consideration, according to a submission by the Community Council for Australia (CCA) to a parliamentary inquiry. The Parliamentary Joint Committee on Corporations and Financial Services is inquiring into whistleblower protections in the corporate, public and not-for-profit sectors. In November 2016, the Senate referred the inquiry to the committee asking it to report back by 30 June 2017. Submissions closed on February 10. CCA said in its submission that it was very interested in ensuring that any whistleblower protections recommended by the inquiry were going to improve the situation for whistleblowers without having a detrimental impact on the capacity of organisations to continue to serve their communities. “This can be a fine line when we consider the limited capacity in many small NFPs,” the submission said. CCA said it believed NFPs must be actively engaged in the proposed process for developing any new provisions and it would only support new requirements for whistleblower protections if there was appropriate scope for NFPs to have a significant input into their development and the way they are to be implemented. “CCA strongly supports the role of whistleblowers in improving the capacity of the sector to better serve their communities. This does not mean CCA supports the creation of new or onerous reporting or monitoring requirements on all NFPs,” the submission said. CCA CEO David Crosbie said that there needed to be further consultation around what works well across the NFP sector and what is not working. “Any attempt to improve whistleblower protections needs to be grounded in a well-informed understanding of what will work in practice across the NFP sector to better support whistleblowers,” Crosbie said. “Given the size of the sector, the fact that it is now administering over $130 billion in income each year and managing over 1.1 million Australian employees, ensuring whistleblower protection works in this sector should be a policy priority. He said it was not at all clear that there were good whistleblower protections for all people working within or as part of the NFP sector. “This is not to say no protections exist, but the nature of those protections seems to vary considerably from well-developed codes of conduct (an example of this might be the Australian Council for International Development Code of Conduct) to almost no documented protections at all,” he said. “Many NFPs operate within areas such as education or health where the application of broader whistleblower protection obligations are integral to employment practices. The submission said one of the major concerns for many across the NFP sector was the appropriate scaling of requirements not only in relation to whistleblower protections but also in relation to other areas of reporting and accountability. “The vast majority of NFPs have a total income of less than $100,000. While most of us are aware of the outstanding work of many big-name charities, it is important to remember that these larger national charities are the exception. The top 10 per cent of charities receive 90 per cent of the income earned by all charities,” Crosbie said. “Small organisations who may or may not have paid staff should not have to fulfill unrealistic requirements. The Australian Institute of Company Directors has also called for significantly stronger and broader whistleblower protections to improve good governance and protect those who expose illegal practices. In its submission, the AICD recommended a range of improvements to the current whistleblowing regime including expanding the number and type of people protected under the act, broadening the definition of “disclosable conduct” and extending protections to anonymous whistleblowers. 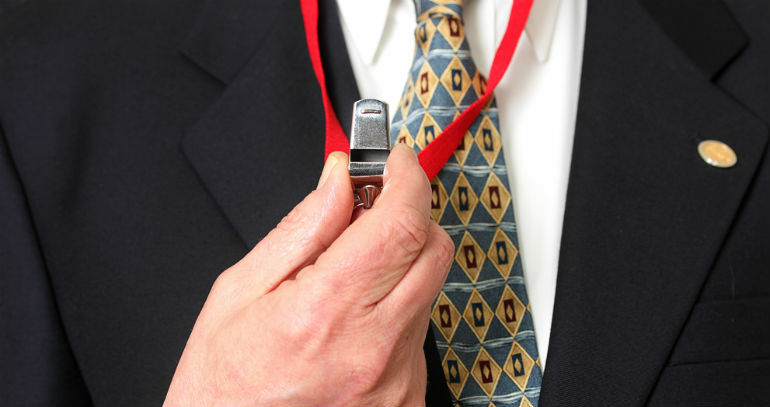 The AICD has also called for increased penalties for corporations that victimise or harm whistleblowers. AICD chairman Elizabeth Proust said the current regime placed too much burden on the whistleblower and failed to encourage best practice governance frameworks. “Presently, only current employees who are disclosing certain offences are covered,” she said. “If we want a strong whistleblowing framework, we cannot and should not expect whistleblowers to be experts on the Corporations Act. “There is also little reason why former employees or contractors shouldn’t be protected if they report wrongdoing. Proust said company directors wanted to know if there was corporate wrongdoing happening within the organisations they govern, and a robust whistleblowing regime that encouraged reporting could help make that happen.